A dark, gritty crime drama from The Laphams (David and Maria), Lodger’s slow burn draws you in and hooks you with its complex narrative and attention to detail and characterization. What else would you expect from David and Maria? Not only do they deliver a great first issue of a new series, they deliver former Vertigo Comics’ Editor Shelley Bond’s new imprint, IDW’s Black Crown, with its first solid original hit. 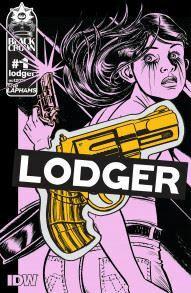 The story’s protagonist Rickey Toledo is instantly captivating and her characterization and motivation are revealed slowly and deliberately by The Laphams throughout the first issue of Lodger. She’s tough, resourceful, and driven, yet she’s not perfect. Her determination foreshadows her (hopeful) success in capturing her prey. I have a feeling that a major point of her development over the series though will come down to just how far she is going to be willing to go to achieve her goal. David handles the artistic duties on the story and his use of thick lined, black and white panels and images helps reinforce the sense of dread and determination the story demands. It also draws the reader in to helping construct the necessary action that takes place in the gutters between David’s images. The Northern Michigan town that the serial killer and his pursuer Rickey travel through boasts a Lake Superior boat ride tour designed to tote tourists out to view the Northern Lights. A powerful display of atmospheric colors is only hinted at in black in white here reinforcing metaphorically Rickey, and “Dante’s” single minded pursuits. There is no variation or color to their lives. Only the black and white of their missions, and something as beautiful as the Northern Lights is irrelevant to them as therefore the reader. It’s a smart way to bring out the seriousness of the narrative metaphorically. Black Crown’s Lodger is a hit only one issue in, and should be on the top of your monthly reading pile for as long as it lasts.